Here in NY, her show is on NBC in the morning. Grammy-winner, chart-topper, and entertainer of the year Shania Twain goes on a field trip with Martha and meets Martha's prized Fresian horses. Back in the studio, Shania learns No. 20 of "30 Things Everyone Should Know" and teaches Martha how to make Poutine, Canadian comfort food. Plus, New York chef Josh DeChellis makes Turducken, an alternative to the standard Thanksgiving fare. SO AWESOME!!! I think we should be able to get alot of Shania's wonderful personality from this appearance. This is what one of those horses looks like..
Love it dax! The robot is cool! We get Martha here at 10:00 a.m. on our local ABC affiliate. ahhhhhhhhhhh tomorrows the day....so excited!!! Me neither.....the next couple of days should be very Shania filled!! Yes..and remember the appearances from the next few days need to last us quite some time...! Martha is a very proud owner of Friesian full breed horses I believe she has six. Shania used a Friesian on her TDIMM video. Shania's retired mounted police horse is a Friesian named Queenie a Friesian second generation. 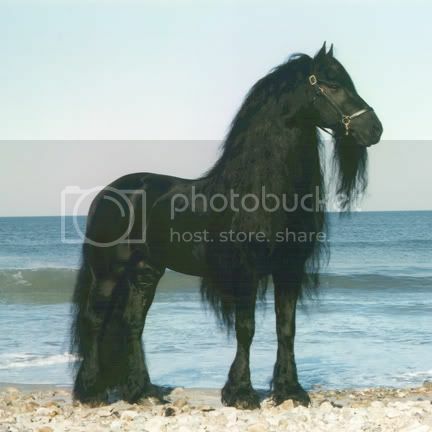 Friesian are very regal looking horses that love to dance their extremely active horses. Can't wait to read it when I get home from work.